Manufacturer of a wide range of products which include food temperature gauge. 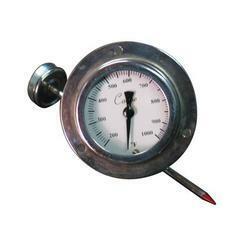 We are one of the top notch companies offering a wide range of Food Temperature Gauge to the market. Known for their applications in food and beverage industries, these offered products are widely known amongst our clients for their précised design and perfect construction. Being one of the popular and highly demanded temperature measuring instruments, these products finds their uses in hot water boiler, domestic & industrial heating system, power plant and pharmaceutical industry.